As part of her MA at Manchester Metropolitan University, Elisabeth Sennitt Clough took 40 credits of elective courses: Teaching Creative Writing and Enabling New Writing. Through tutorials with UK leaders in creative writing education for adults and children, she is fully conversant with contemporary pedagogical/andragogical approaches. She has taught in schools (all ages and key stages) and has led workshops for adults as part of a three-day creative writing seminar and as weekly ongoing sessions. She is a professional member of the National Association of Writers in Education (NAWE), an organisation that provides full background checks for professional members. As a workshop leader, Liz takes her students gently by the hand and leads them through the various exercises with quiet confidence. Not once do you get the idea that you might not be able to do something. Her prompts are excellent and lead the students to unexpected places, yet there is always enough material to write about. Liz has a knack of opening doors to creativity you didn’t know were there. She is a well-prepared, thoughtful writing tutor and I cannot imagine a group whom she would not be able to coax into writing. This is not the first workshop I’ve done with Liz and I find myself looking forward to these experiences every time. I approach them knowing three things: I will be surprised. I will write. I will be safe. – Colette Victor, author of What to Do with Lobsters in A Place Like Klippisfontein. 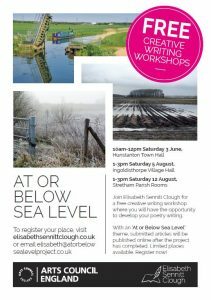 As part of my ACE-funded ‘At or Below Sea Level Project’, I am running four free workshops. Please email me: atorbelowsealevelproject@gmail for further information.